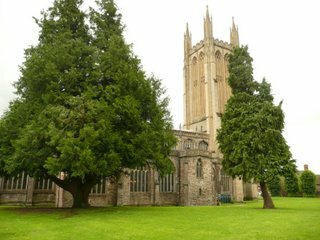 St Cuthbert's is the largest parish church in Somerset. We are so big, and have such a prominent position in the heart of the city of Wells, that visitors often think they have reached the Cathedral as they enter our mediaeval entrance porch. The church is open every day of the week, and provides a friendly place to meet and make friends. Cuthbert's Kitchen serves tea and coffee most mornings, with a hot Market Day Lunch available each Wednesday. Others like to visit or just pop in for some spiritual peace and refreshment. Worship is the central focus of our spiritual life, and the 10 o'clock Parish Eucharist is our main Sunday service each week. There is also a short, said 8 o'clock Communion service in traditional language on the first Sunday of each month. Like all Church of England churches, we are pleased to welcome anyone from any part of the worldwide Christian church to join with us in our Sunday worship. If you are coming to worship with us for the first time, do make yourself known to the welcome team at the door as you arrive. Everyone who normally shares in the bread and wine of their own church is welcome to join us here. People from a wide variety of spiritual backgrounds, and several different nationalities, have been brought together in this place with many others from closer to home to explore what faith in Jesus means in this 21st Century, conserving the strengths of Anglican tradition while looking for ways to explore faith and emerging Christianity. Wherever you come from – near or far – and wherever you are on your spiritual journey – we hope you will feel a warm welcome when next you visit us. The Parish of St Cuthbert, Wells will foster and encourage best practice within its community by setting standards for working with children, young people and vulnerable adults. It will work with the Diocesan Safeguarding team, statutory bodies, voluntary agencies and other faith communities to promote the safety and well-being of children, young people and vulnerable adults.